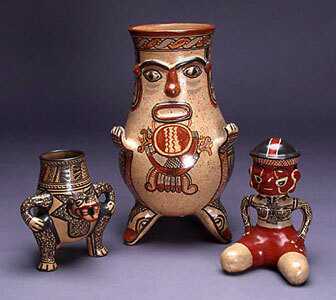 These ceramics come from the Nicoya Peninsula in the Pacific northwestern part of Costa Rica. They were purchased directly from the manufacturers in their homes in the small village of San Vicente. Cordry Intern Leslie Spoelstra is living in San Vicente and working with potters to study their ceramics cottage industry. These ceramics are replicas and near-replicas of pre-Columbian antiquities. Today's artisans have illustrations of originals in books and photocopies that they keep handy in their workshops. They "mix and match" design elements more often than trying to make exact copies. The Cordry Internship in Mexican Folk Art is an endowed internship in the Department of Anthropology at the Science Museum of Minnesota. A Cordry Intern is selected every two years from applicants from Minnesota colleges and universities. In 2000/2001, the Cordry Internship was redirected to Costa Rica to take advantage of a unique collaborative research opportunity involving anthropologists from several museums and universities. See the October, 2000 Object of the Month for a shawl collected by a past Cordry Intern, or read more about the Cordry Internship and SMM's Mexican research and collections.